Three states in northeast India – Tripura, Meghalaya, and Nagaland – have voted in favor of the status quo, with ruling parties holding on to power. Political experts say the results of the elections, released Thursday, did not come as a surprise. In Tripura, the Communist Party of India (Marxist) won an overwhelming majority of votes for the fifth local election in a row. The CPI (M) won 49 seats in the 60-member state assembly, according to the Election Commission of India. This is three more seats than the party won at the last state elections there in 2008. The Congress party, the main opposition party in the state, secured 10 seats, like in 2008. Tripura is the only state in India ruled by Communists, who have been in power there for over two decades. “The results in Tripura are on expected lines. We knew the left would come to power again,” said Kashi Nath Jena, professor of political science at Tripura University. “Economy in the state is yet to take off. But so far whatever little has been achieved has been successfully redistributed by the left government among masses. And this is the trump card to its success,” he added. Mr. Jena said that Chief Minister Manik Sarkar helped secure a victory for the CPI(M). “He’s popular among locals,” he said. Mr. Sarkar, widely seen as an honest administrator, has held the top post in Tripura for the past 15 years. In Meghalaya, the ruling Congress party-led coalition won 37 of the state assembly’s 60 seats. Congress alone secured 29 seats, four more than it did at the 2008 election. Its coalition partner- the United Democratic Party – won eight seats, fewer than the 11 it won at the previous elections. The National People’s Party, a local party set up recently by Purno Sangma, a former senior Congress politician, got two seats. A.K. Baruah, a retired professor of political science at the Meghalaya University, said the separatist insurgency that has been plaguing the state for decades is “no longer the main issue” in the elections, though incidents of violence continue to take place from time to time. In Nagaland, the regional Naga Peoples Front party that heads a coalition of smaller local parties, secured 38 seats in the 60-member state assembly. The Congress party, the main opposition in the state, won eight seats, a significant drop from the 23 seats it won in 2008. In Nagaland, where the separatist rebels are especially active, the “main election issues were development and integration of Naga regions,” said Monalisa Tase, who teaches political science at Nagaland University.The state’s local tribal population has long demanded carving out new states for different ethnicities. 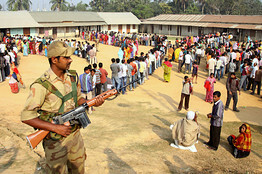 Tripura voted on Feb. 14 and people in Meghalaya and Nagaland went to the polls on Feb. 23.